Dec 19, 2016: What Budget Monitor Should I Buy? Dec 20, 2016: What is the best 144hz gaming monitor for 200-300 dollars right now? Dec 20, 2016: AOC G2460PF what's the Flaws? Dec 22, 2016: PC for Steam Games Mostly (UK approx £900). 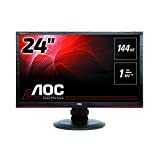 Dec 26, 2016: [Troubleshooting] Christmas Troubles - AOC G2460PF color discolorations and 'static' when raising monitor(s) above 60hz and many more issues! Dec 28, 2016: New 144hz monitor, help?? Dec 29, 2016: Switching back to AMD. Definitely would appreciate you guys answering some questions before I make the switch. Thanks! Jan 02, 2017: Good 1080p 1440hz Monitor? Jan 04, 2017: Can't run 144hz with 1080p, 1920x1080 using DisplayPort. Jan 11, 2017: Questions about a build. Jan 17, 2017: Ships usually within 1-2 months but has 2-day shipping with Prime? Jan 17, 2017: Should I wait or should I purchase? Jan 19, 2017: Sorry to bring up this age old question, TN, VA, or IPS for my build? Feb 01, 2017: Is this monitor safe to buy? It seems pretty cheap for 144hz monitor. This is also my first time buying anything from amazon so is it legit? Feb 02, 2017: 1080p 144hz Freesync Monitor decision. Feb 12, 2017: Is My Build Good for 1080p 144hz Twitch Streaming? Feb 15, 2017: Why is the Freesync version of the G2460 less expensive than the basic model? Feb 17, 2017: Asus or AOC monitor? Feb 19, 2017: Which one of these 4 monitors? Feb 24, 2017: Freesync Monitor with Nvidia GPU, will it work? Mar 03, 2017: Zowie XL2411 Or g2460PF for gaming? Apr 16, 2017: 1080p 144hz Monitor for $200? Apr 18, 2017: Upgrading my monitor, Can't decide on what to get. May 01, 2017: $1400-$1600 PC for cs:go and other games. May 01, 2017: Looking to buy a nice monitor, help me choose between options or suggest one of your own. May 22, 2017: AOC G2460PF? May 24, 2017: Looking to get 2 new monitors struggling on what to get. Looking for some advice/suggestions. May 28, 2017: Can someone let me know if this is a good monitor for my setup. May 31, 2017: Will this AOC G2460PF gaming monitor work with a late 2011 macbook pro? May 31, 2017: Good monitor for gaming with good colour reproduction? Jun 03, 2017: Which monitor should I get? Jun 06, 2017: Monitor died, but not ready to replace my GTX780. Worth it to future proof with a 1440p 144Hz? Jun 08, 2017: Benefits of a FreeSync monitor? Jun 18, 2017: Looking for a 144hz monitor. Jun 28, 2017: Need to upgrade my monitor! Any RX480 recommendations? Jun 29, 2017: Need help with ports! Jul 05, 2017: Never had 2 or 3 monitors but I think i want to make the jump straight to 3. How well would you figure it will work on this L shaped desk im getting shipped to my house? Jul 10, 2017: ultriwide or gaming? Jul 12, 2017: Is 144hz Worth It? Jul 12, 2017: Which monitor should I buy? Jul 22, 2017: Buying a 1080p monitor, need help deciding between these two. Aug 02, 2017: AOC 24" G2460PF Owners, What are your thoughts on it? Aug 09, 2017: Cheap 1440p/144hz monitors? Aug 13, 2017: Best 24 inch 1080p 144hz Freesync monitor? Aug 24, 2017: Best 144hz 1ms 1080p monitor for under $300? Sep 06, 2017: Previous post lead me to believe the AOC G2460PF is not that great. Can anyone explain why? Sep 08, 2017: Am I safe to buy the aoc g2460 pf? Sep 15, 2017: Looking for advice for my first ever PC, any ideas/criticism welcome! Sep 18, 2017: What is better? Sep 26, 2017: Is this a good deal? Oct 05, 2017: My monitor fell forward on it's stand and cracked, what can I do? Oct 10, 2017: Can't find any 100hz Freesync 1080p monitors - do they exist? Oct 18, 2017: 144 hz monitors for ~200, best deals for best monitor in price range? Nov 01, 2017: Monitor Help! Nov 06, 2017: Asus MG2480Q or AOC G2460PF? Both on sale so which should I get? Nov 18, 2017: Which Monitor? Nov 19, 2017: Any Advice for a budget monitor? Nov 22, 2017: 144hz monitors, should I buy with my specs? Nov 24, 2017: Cheap 144hz Monitor Recommendations? Nov 27, 2017: Recently bought a second monitor. Now certain games run at 1/10 the fps. Dec 21, 2017: Having a hard time deciding on a 144hz monitor. Dec 30, 2017: Should I upgrade my monitor from 1080p 144Hz to 1440p 144hz? Dec 31, 2017: [Purchasing Help] Which one of these is the better deal? Jan 15, 2018: Ready and about to buy. Ryzen 5 1600 / RX 580. Last minute suggestions? Jan 17, 2018: Is the change from 768p 60hz to 1080p 144hz FreeSync worth it? Feb 16, 2018: What is the best monitor for under $200 CDN? Feb 21, 2018: Is there a better freesync monitor than this one for around the same price? Mar 26, 2018: Which of these monitors would be the best/any recommendations? Mar 29, 2018: Can my pc run these monitors? May 02, 2018: Anyone know of a cheapish 144hz monitor? May 23, 2018: Which monitor? Jun 13, 2018: [Build Help] Looking at monitors. Jun 13, 2018: [Purchasing Help] Need help settling on a monitor. Jul 20, 2018: Which 1080p144hz freesync screen is better? Jul 23, 2018: Which of these 2 monitors should I get? Aug 02, 2018: What is the difference between FQ/PF/PQU/VQ6 monitors? Sep 12, 2018: Desk recommendation to survive a dual monitor mount. Nov 12, 2018: Where in my build can I cut costs without too much of an impact? Nov 27, 2018: AOC G2460PF vs Acer GN246HL, or something else? Nov 28, 2018: Monitor Comparison - Opinions Wanted!! Jan 06, 2019: Monitor help! Jan 17, 2019: What are the checks I would want to hit in order to make sure I get the best quality 144hz monitor that aren't gimmicks? Jan 22, 2019: Indecisive buyer looking for a monitor. Jan 29, 2019: Is it a matter of time before all modern freesync monitors are supported by nvidia? Mar 01, 2019: 144hz monitor with best looking screen and colors? Mar 09, 2019: Which monitor? Mar 10, 2019: Which monitor? Mar 16, 2019: What 144hz monitor do you guys recommend for someone who wants to use freesync? Apr 22, 2019: I've been suggested a parts list for a gaming pc, I've changed some parts and would appreciate it if someone could double check it for me.